Encourage ideas from suppliers as they often know your business better than some of your own team. Promote your commitment to the supplier innovation programme and ask your suppliers to invest time into providing new ideas. Respect their time by giving them as much notice of changes to requirements and key members of staff, so they can spend the time on innovation. Be suspicious of ideas that come from your suppliers - your strategy, innovation and R&D teams know your business better than anyone externally. In the name of excellence, encourage cut-throat competition. If a new idea comes in from a supplier, immediately put it out to the rest of your suppliers to see if they can provide it cheaper. Even better run a RFX and auction. Ensure quarterly reviews don’t happen. Make sure the procurement team are so busy that they don’t have the time to hold their quarterly meetings with top suppliers. Having a face to face meeting with suppliers on a regular basis may provide a sign that you care about the relationship. To every action, there is always an equal and opposite reaction. Newton surely wasn’t thinking of the supply chain when he created the laws of motion, but in today’s investor marketplace, the law often holds true. As the darlings of the tech world, everything at Apple is closely monitored, analysed and measured, especially the supply chain. Recently, at least 5 core analysts lowered their price targets on Apple amidst reports that the company was cutting some iPhone parts orders in its Asia supply chain. The stock price quickly dropped roughly 9%. Successfully delivering better value and better outcomes from procurement activities requires managing many competing priorities. Whether delivering cash releasing savings, creating strategic social value or managing environmental sustainability, the need to anticipate, measure and communicate the economic and financial impact of our decisions is becoming more and more essential. Traditionally, category managers focus solely on finding lowest cost options and give little consideration to factors beyond the traditional procurement scope, such as increasing business with small-to-medium sized businesses (SME), local or diverse suppliers. Recently the International Air Transport Association (IATA) made a bold prediction for 2013: Airlines will earn global net profits of £5.17 billion despite volatile fuel prices and weakening demand. Procurement Leaders reporter Tim Burt wrote an interesting post last week based on the results of the latest Procurement Intentions Survey. The numbers outline a story that we hear often: our industry is hungry for new technology. The latest Supply Management Poll shows Stakeholder Relationships to be the number one priority for Procurement staff for 2013, with 45% of respondents identifying it as their major priority for the year. This was followed by 27% choosing Supplier Relationship Management, giving a total of 72% looking to improve relationships. We are now well into January and perhaps we are a little late with some New Year resolutions, but if you're still thinking about making some, here are three easy and attainable procurement resolutions that will help your organisation control costs in the coming year. According to the Aberdeen Group, ineffective control of Contract Management costs businesses £100 billion per year in missed savings opportunities. Implementing a Contract Management tool into an organisation for the first time can be a daunting prospect. Most organisations I meet that are considering Contract Management share common traits and beliefs. Whether you’re just beginning your career at the executive level or joining a new company, the first 90 days as a CPO are critical for establishing long- term success, and your work starts before the first day on the job. How willing are people in and outside procurement to change? What additional resources are available for new technology, training or consultants? Who are procurement’s best fans? Blockers? 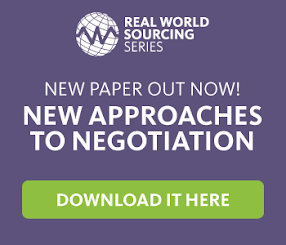 The arrival of the new year heralds the arrival of a new syllabus of Real World Sourcing Expert Briefings. Working again in conjunction with Spend Matters and Guy Allen (previously CPO at Abbey, Santander and Fujitsu), and following great feedback from the 2012 series, we've put together a program that covers, what we believe, are some of the hottest topics in procurement. If you're looking for real-time procurement news and analysis, look no further. These 10 supply chain influencers will keep you up-to-date on everything you need and want to know via Twitter.